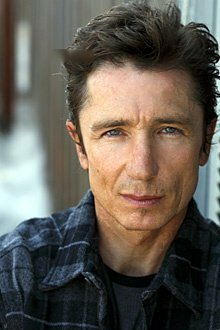 English-born Dominic Keating, who played tactical officer Lt. Malcolm Reed on Star Trek: Enterprise (2001-2005), is excited to be a guest again on Cruise Trek 2013, a Trek-themed cruise adventure on the Seine River in France (October 25-November 1). Since 1966 when the original Star Trek series premiered on television, the Star Trek juggernaut continues on with unabated fan enthusiasm. From the Official Star Trek Convention -- the next one is in San Francisco, November 8-10, 2013 -- and various Comic-Con conventions all over in the US to FedCon in Germany, Keating says "Star Trek fandom is alive and kicking" almost 50 years on. Keating is turning out for his fourth Cruise Trek and has made up to 100 appearances himself at various events including a special appearance onstage with iconic Leonard Nimoy (Spock) in 2005 at FedCon in Bonn. Keating tells a personal story that reflects why the Trekkie phenomenon continues to grow. He was at a public viewing in L.A. of the 2013 summer blockbuster, Star Trek Into the Darkness, and was gleefully watching Spock (Zachary Quinto) battling with Khan (Benedict Cumberbatch) when he heard a little voice screaming out. "I look behind me and this little African-American boy with eyes wide open and popcorn in his mouth was shouting, 'Way to go, Spock!' His mother looked equally transfixed. And so a new generation of Trekkies is born!" Keating appeared in 98 episodes of Star Trek: Enterprise, a prequel to the original series and which also starred Scott Bakula as Captain Jonathan Archer and Jolene Blalock as Vulcan Sub-Commander T'Pol. Keating is a fan himself of the franchise and loves making appearance including these Cruise Treks. He's previously cruised up the Rhine, for example, from Basel to Amsterdam. "It was during the Christmas period and it was achingly beautiful. We stopped off at all these historic castles, eye opening really. At one stretch, the river was banked by steep cliffs on either side and there were clusters of castles and turreted buildings everywhere. Simply mesmeric. This upcoming Seine River cruise will likewise stop at historic spots on the way to Normandy, where the Invasion happened." Affable Keating starred on the long-running UK sitcom, Desmond's, before arriving in Hollywood. He says Cruise Trek founder Charlie Datin "puts on a first class show for the fans" and has been running these Trek-themed cruise adventures since 1992. Datin has brought along many of the franchise's biggest stars from George Takei (Sulu), James Doohan (Scotty) and Walter Koenig (Chekov) to Wil Wheaton (Wesley Crusher), Robin Curtis (Lt. Saavik), Roxann Dawson (B'Elanna) and John de Lancie (Q). "Charlie pulls out all the stops for his guests/fans with games and poker nights. On this Cruise we're having a Halloween party. I'll do a Q & A with the fans. I've gone a few times with Vaughn Armstrong who guested on several Star Trek shows, many times in prosthetics. Then he got to be himself on our show as Admiral Forrest, Scott Bakula's boss. Vaughn's a musician and he's brought his son along to Alaska and Bermuda. They perform and are very talented musicians. Everyone's really cool and I feel part of the family. I'm just the chatty, funny, story-filled cousin that comes with them on the Cruise Treks. It's very fun thing to do." Keating, who recently voiced Templar for Diablo III, a popular fantasy videogame, is all packed, ready for the cruise adding, "And I finish up the trip with a night in Paris, and a visit to the Moulin Rouge. Live long and prosper, indeed!"